Faraday, you haven't been napping all night. Great artwork! Also a good way to keep the toofies clean. Good job Faraday. I'm proud of you pal! Cool TP Art! Faraday you are a genius. Have a wonderful Wednesday. MOL. 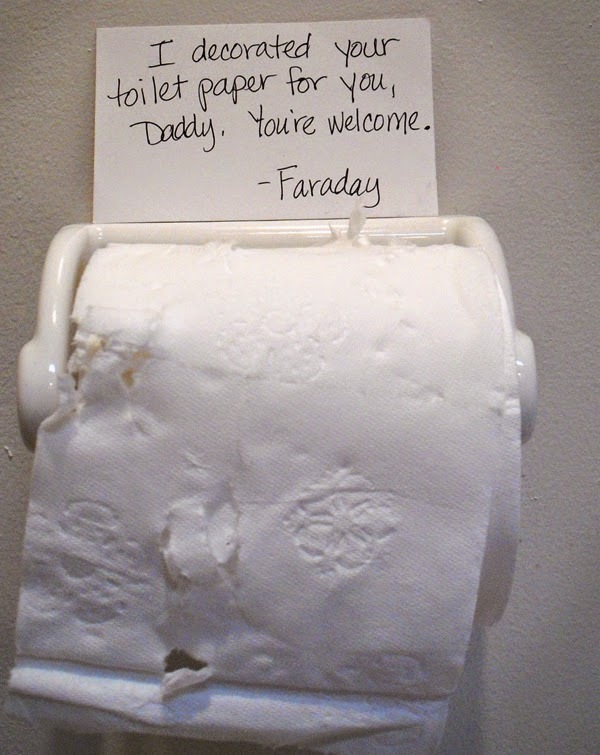 We're pretty sure your Daddy *appreciates* all your work, Faraday! Was our Allie at your house? She's our resident Toilet Paper Designer! DOOD! Great job, Faraday. You, our friend, are an ARTISTE! Lol um wow Faraday... I'm not sure what to say?! It's the opposite of "dog shaming", it's "cat pride"! Good job Faraday! You know they'll love you no matter what you do! MOL!!!!!! Do you teach arts & crafts classes? We want to attend! It almost looks too pretty to use! I hope you can hear us laughing. I know the neighbors can. Brilliant! We love your decorating work. Faraday, high paws all around. We think that the note was a really nice touch, Faraday! We've heard TBT say that some TP needs better "perforations". So good werk! I hope it was appreciated?! What a great way to bring a little art into your dad's day.. You are so darn generous! ROFLMFTO!!! and Mom is right next to me!!! That's a masterpiece! I hope your dad was proud! !